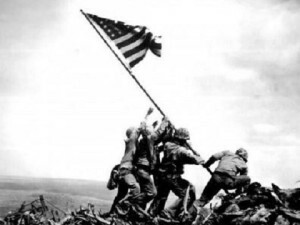 Raising the Flag on Iwo Jima, a photograph by Joe Rosenthal, is an iconic image that we all should be familiar with. It is perhaps that single most reproduced picture ever captured. If you have not seen the original image, you probably at least have seen some replication of it either in print or as a monument. It was taken on February 23, 1945 (almost 71 years ago). It depicts six soldiers raising the American flag after the island of Iwo Jima was captured during World War II. It was captured, developed, transmitted, and printed on hundreds of newspapers in the U.S. in less than 18 hours, an astonishing feat for that time. The picture invoked a sense of patriotism and the belief that our soldiers were fighting the good fight and emerging victorious. The image still calls to mind the sacrifice that was made so that we could live with the hope of freedom. That we can have the life that we desire. Of the six soldiers depicted in the photo, one of those was Ira Hamilton Hayes. Ira Hayes was a Pima Indian who was born on the Gila River Indian Reservation in Sacaton, Arizona, on January 12, 1923. His father, Joseph Hayes was a World War I veteran. After the attack on Pearl Harbor on December 7, 1941, Ira Hayes was determined to enlist in the Marines. He enlisted when he was 19 years old and at the age of 22 he was planting the American flag on the top of Mt. Suribachi, Iwo Jima. He stayed and fought on the island until it was declared secure on March 26th. His company suffered many casualties and he was 1 of only 5 Marines remaining from his 45 man platoon. By that time, 3 of the original 6 men in the photo had been killed in combat. Ira Hayes and the 2 other men in the photo became war heroes. They were called back to Washington D.C. to meet the president and participate in fund raising efforts for the war. It is said that Ira never wanted the attention and mostly suffered from post traumatic stress and survivor guilt. He carried the guilt that so many soldiers had gave their life in the war and were continuing to do so while he was being praised as a hero. He never liked the attention although he was paraded around the country and asked to play himself in the movie “The Sands of Iwo Jima” starring John Wayne. Eventually the fame subsided and he returned home to the reservation but could not find steady work. His guilt soon manifested itself into an alcohol addiction and he was arrested over 50 times for alcohol intoxication in public. He was in and out of jail and eventually his addiction played a part in his death. Ira Hayes died on January 24, 1955, just less than 10 years after the iconic picture. He was 32. 1. Income among the Pima Natives is well below the national average. 2. The unemployment rate is approaching 30% and is close to 50% in some areas. 3. The high school dropout rate among Native teens is close to 50%. 4. Native teens have the highest suicide rate of any other people group in the U.S.
5. The Pima Natives are the 2nd most obese culture in modern history. 7. The average life expectancy among the Pima Natives is only 46 years. Over the next few weeks, I want to describe some of the complexities that go along with life in Sacaton and the surrounding districts. To bring to light some of the specific challenges that have faced the natives on the Gila River Reservation in the past and those that continue to face them in the present. It is my hope that you find yourself in a place of understanding and moved with compassion. But I want to leave you with a picture that I have in my mind. It is a picture of hope! Just as the image of the flag being raised on Iwo Jima is a sign of triumph, I have a picture that is much clearer and much more triumphant. When I see the image of the pole being planted on the mountain and the symbol of our country being lifted up, I cannot stop thinking about the image of Roman soldiers planting a similar pole on a mountain and the greatest of all Symbols being lifted up. Where the one represents a worldly victory in battle and pride in our country, the other represents an eternal victory in the greatest of all battles and the pride in a country named Zion. It is a story where tragedy and brokenness bring about salvation. This story is still being written and the Natives of the Gila River Reservation are a part of this story. I hope that you stick around to hear it and find out how you can be a part of it too! Until next time, God bless and please pray!